Red, Blue, & Green: Want to Save $50 per Month? Saving money was not the goal when I started down the path toward having no wired telephone service, but that is the final result! Like everyone else that was using the EPB/Cinergy/Norlight telephone service, I was told that Norlight planned to abandon the Glasgow market by the end of the year and that I should make arrangements for an alternate service provider. After procrastinating for a couple of months, here is what I did. Our situation is probably very similar to thousands of other families in Glasgow. I have a cell phone, my wife has a cell phone, and we had the old reliable wired phone service to our house. For years we have seen the habit of younger folks to save money and complication by simply using one cell phone and one phone number for all voice communication. As we contemplated the move from Norlight’s service to some other provider, we decided to jump into the same sort of telephone environment which has been working fine for our children. Not only has it worked just fine, we are saving the $50 or so per month that we were sending to Norlight! The first step was to go to our cell phone provider (we happen to use AT&T but this will work with any of them) and tell them that we needed a new cell phone with Bluetooth and GPS features, and we told them we wanted to port our home phone number to the cell phone. This took a bit of discussion as they needed our Norlight account number and we had to agree to pay a $30 one-time charge to port our home phone number to the cell phone. We were also told that the actual port might happen anytime from three days to thirty days out, but we were determined to accept this vague transaction. My wife left the AT&T store with a new Samsung phone armed with Bluetooth and GPS. 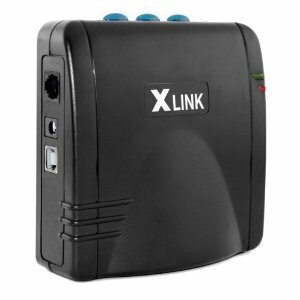 Next we bought this amazing little device http://www.myxlink.com/xlink_bt.aspx called a Bluetooth gateway. We got ours online and simply plugged it in and followed the directions to pair it up with the new cell phone. The thing is simply amazing. When the cell phone is within about twenty feet of the device, they “pair” using the wireless Bluetooth technology. Once they are paired and the device is plugged into any telephone outlet in your house, all of your home phones ring when someone calls the cell phone. Similarly, you can use any of the regular phones in your house, just like you always have, to answer and make calls. The only difference is that the calls are coming and going through the cell phone instead of through a wired telephone provider but you really cannot tell the difference. This is all accomplished simply by bringing the phone into the range of the Bluetooth gateway. After the initial pairing, it happens automatically as you come and go from then on! About four days after the initial visit to the AT&T store, calls to our old home number started ringing through to the new cell phone. Once that happened, we disconnected our home from the Norlight service and finished plugging in the new Bluetooth gateway. Since then, our home phone service acts just like it always did when we are at home and the cell phone is paired with the gateway. When we are gone, we take our home phone number with us via the cell phone. And there is more. One of the fears we had in making this transition was the lack of location identification if we had an emergency and had to call 911. However, since we activated the GPS feature on the new cell phone, I am happy to report that test calls to 911 have, so far, reliably resulted in them seeing my address on their screens! I find this simply amazing. So, at the end of the day, we are saving the $50 per month that we were spending on our Norlight telephone line. We canceled the old cell phone so now we are just out for the monthly cost of two cell phones. This should be very exciting for all of you who are trying to decide what to do about the end of Norlight telephone service in Glasgow as well as everyone else who has a wired telephone line and the desire to save some money. This solution seems to work amazingly well and we will miss fewer calls since we will be taking our home phone number with us when we are away. If you would like help in accomplishing this same result at your home, give us a call or an email.